The equivalent of up to 20 cartridges. If you're tired of constantly adding ink to your current printer, Epson has unveiled a new lineup of all-in-one devices perfectly suited for you. Epson's EcoTank printers come with a compartment specifically designed to house dramatically more ink than your standard color printer. 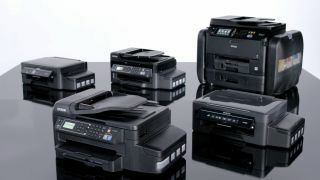 Compared to similar Epson all-in-ones, each of the five new EcoTank models are capable of storing the equivalent of up to 20 previous-generation ink cartridges. Epson says the amount of ink loaded into the EcoTank should last consumers and small businesses for roughly two years. The one downside to the new lineup is that each model is several inches wider and slightly heavier than current generation all-in-ones as a result of the additional ink storage. WorkForce Pro WF-R4640 EcoTank All-in-One ($1,199) is the enterprise darling of the new lineup. It is capable of producing 20,000 black and 20,000 color pages on its initial ink yield. Although it only operates at a print speed of 20 ISO pages per minute in black and color, it holds a whopping 580 sheets. The Workforce ET-4550 EcoTank All-in-One ($499) is better suited for the telecommuter or small business owner. It can produce up to 11,000 black and 8,500 color pages at up to 13 pages per minute in black and 7.3 pages per minute in color. The lineup also includes smaller models the Workforce ET-4500 ($429), the Expression ET-2550 ($399), and the Expression ET-2500 ($379). You can fill each of the new units (except for the R4640) with a new set of ink bottles for only $52.99, which is the roughly £34. For the R4640, you can refill the ink bags, which print off 20,000 pages, for about $280, or roughly £180. Each of the new units will be available in September.